When it comes to small, easy to store Treadmills there are two ways to go: Portable Treadmills or Folding Treadmills. Which one is right for you depends on your circumstances. In this article we’ll look at the difference and the pros and cons of each choice, to help you pick the right treadmill for your exercise needs. 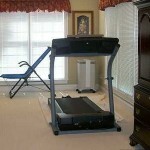 Like the name suggests, portable treadmills are designed to be easy to move from place to place. They are great for people who need to take their treadmill with them – either from house to house, or away with them on vacation or for whatever other reason. They are lightweight and fold up into a small space to be easy to carry and transport. However, in order to make them portable manufacturers usually keep features to a minimum, and portable treadmills tend to the simpler side. Price: Because of their simplicity and usually small feature set, portable treadmills tend to be the cheapest treadmills you can buy. Portability: As you’d expect! When folded up these treadmills can be as small as 1 ft x 2 ft and have wheels for easy moving. This also makes them very easy to store. Stability: The lighter the treadmill, the shakier it can be. This is especially true for larger and heavier runners, who exert a force several times the weight of portable treadmills. A lack of features: As mentioned portable tends to mean more simpilcity. Engines on portables tend to be weaker, and they tend to have no motor to control the incline, which needs to be set manually. The consoles tend to be simpler too, so there’s less workout programs as well. Again, the name doesn’t need much explaining. Folding treadmills are designed to be easy to fold up and then store away somewhere in your home (under a bed is a typical storage place). They don’t always fold in every dimension, often the base is relatively rigid and the top section will fold down or detach. While generally smaller than non-folding types, folding treadmills aim to be compact when folded up but not light. To help move them they tend to come with wheels or similar aids. 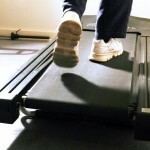 This article has a good review of the potential benefits of folding treadmills. More features: Treadmills that do not move as much can support multiple motors, better consoles and more options all round. 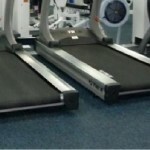 Some folding treadmills have close to as many options as those non-folding ones found in gyms. Cost: Not surprisingly, the more features and better quality of folding treadmills see them come in a lot more expensive than their folding counterparts. Portability: Because of their much heavier weight and larger size when folded up you won’t be able to easily take folding treadmills from place to place. Storage: While they are designed to go relatively flat, they don’t fold up as small as portable treadmills. Portable treadmills are great for people who need a treadmill they can fit in their car to take from place to place, or people who live in compact homes where storage is at a premium. Generally, though, the quality, features and stability of folding treadmills make them a better choice for most people, especially those who use their treadmill a lot. Why Buy a Portable Treadmill?